Board of Intermediate & Secondary Education Quetta has the responsibility to conduct annual and supply exams of matric and intermediate class in the province of Balochistan. All the schools and colleges in Balochistan, either public or private, are affiliated with Quetta Board. Thousands of regular and private students from all over Balochistan participate in the SSC and HSSC exams every year under BISE Quetta. Quetta Board conducts the matric annual exams during the months of March and April while the intermediate annual exams are conducted by the board in May and June. Written papers are held earlier which are followed by practical papers for the students of science group. Admission forms are available for the students few months before the start of SSC annual exams and HSSC annual exams. The students deposit the fee in the prescribed bank branches, fill the admission forms and then submit the forms along with necessary documents and fee challan form. The students are allowed to fill the forms with single fee, late fee and double fee. 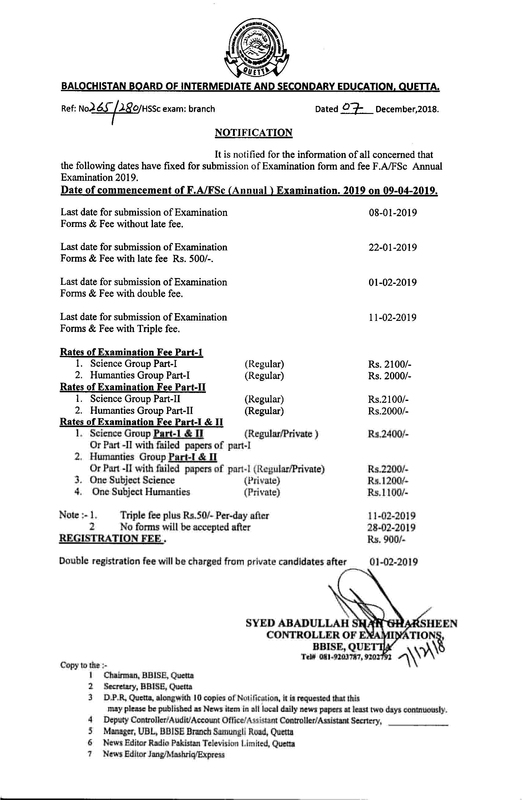 After the submission of examination admission fee, the board issues roll number slips for the students. Through the roll number slips, the students know about the schedule and venue of exams along with the important instructions. But in case there is any deficiency or mistake in the admission form, the board will send the admission form back to the student and he/ she has to resubmit the admission form after completing or correcting the form as early as possible.